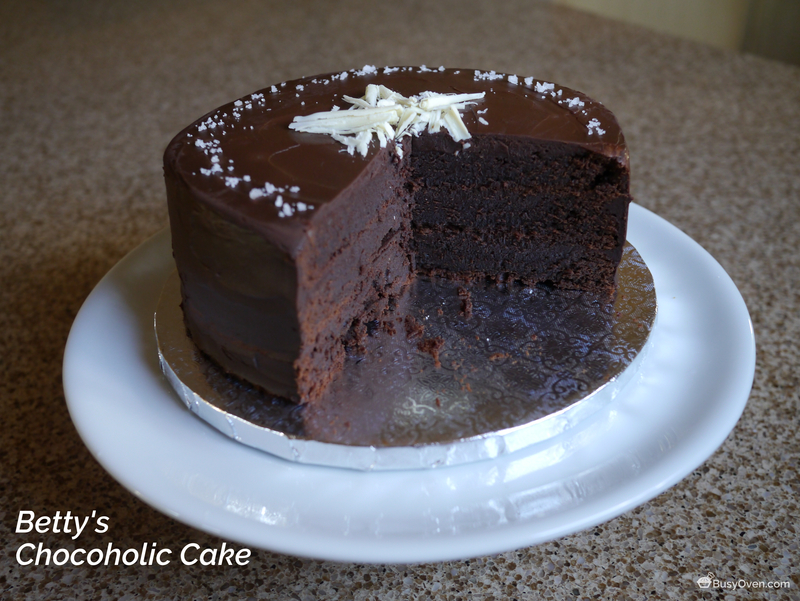 This cake truly deserves to be called a chocoholic cake. There is an incredible amount of chocolate used in this recipe. Making the cake batter was not unlike making brownie batter. I had a feeling that the cakes would end up being too sweet, so I added a little bit of salt; there’s nothing wrong with salted chocolate, right? While the chocolate cooled down, I mixed the eggs, sugar, and salt together until the eggs turned pale yellow. I folded flour into the egg batter and then added the melted chocolate. Dorie’s recipe said to use 9-inch pans, but I used three 8-inch pans instead. My reasons for doing this were twofold and are the result of my laziness: 1) I only had two 8-inch pans, and 2) three 8-inch pans fit onto one of my baking racks. This was the point where I realized that I forgot to add parchment paper to the bottoms of the buttered and floured pans before pouring in the batter. This proved to be a testament to my two Williams-Sonoma gold pans which worked incredibly well; the cakes just popped right out. My other [unnamed] brand pan, however, had cake stuck to the bottom of the pan. Luckily 98% of the cake from that third pan came out just fine. When the cakes cooled, I made chocolate ganache that would go between the cake layers and cover the outsides. It took a while, but it came together nicely. Constructing the cake was pretty fun. The tops of the cakes had that great thin, crispy chocolate on top, like brownies. That meant that they weren’t even, and it’d be a waste to cut the crispy tops off just to level the cake layers. This is where the chocolate ganache came in handy by filling in the dips in the tops of the layers. I think the cake looked great while it was naked. I suppose it looks okay dressed up, too. I sprinkled some fleur de sel to the top of the chocoholic cake just to add more flare and depth of flavor. The photo doesn’t do it justice, but the salt looked like tiny jewels on the cake, sparkling in the sunlight. This chocoholic cake ended up being a birthday cake. I’m glad that I added that salt because it was really chocolatey and fudgy; the salt really shined through all of that chocolate. This really is the perfect kind of cake to eat with ice cream. I can even attest that cookies & cream ice cream pairs extremely well with this cake! All in all, this was a fun cake to make. It’s really rich, but it’s really easy to eat with ice cream. Betty’s Chocoholic Cake recipe is on page 67 of Baking Chez Moi by Dorie Greenspan. Your cake is lovely and I like the sea salt idea. I halved the recipe because there was so much chocolate and butter! I like the effect of using the smaller cake pans…..it looks sooo tall. And the salt is a nice touch. Shout cake looks delicious and I love the idea of decorating it with sea salt is brilliant, looks yummy. Perfect as always. I hope the birthday celebrant enjoyed it. The fleur de sel was a nice touch.